“This striking bureau cabinet, decorated with chinoiserie scenes imitating Oriental lacquer, takes its inspiration from the form of early 18th century Anglo-Dutch examples, which quickly took root as important pieces of furniture in the grand palaces of the Venetian aristocracy and rising merchant class. Isn’t that magnificent? I’m a huge fan of Italian painted furniture. The North produced really glorious, interesting and whimsical pieces. Over the weekend I’ll be posting pictures of a really charming Venetian console table done in the same technique which is often referred to as lacca povera or arte povera. 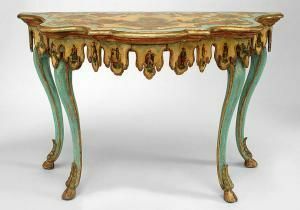 Technically that only referred to pieces where prints were applied to wood furniture, then gilt or painted, then varnished repeatedly (until it looked like lacquer) – but the term is now a catch-all that refers to anything resembling lacquer-ware which was made in Northern Italy. 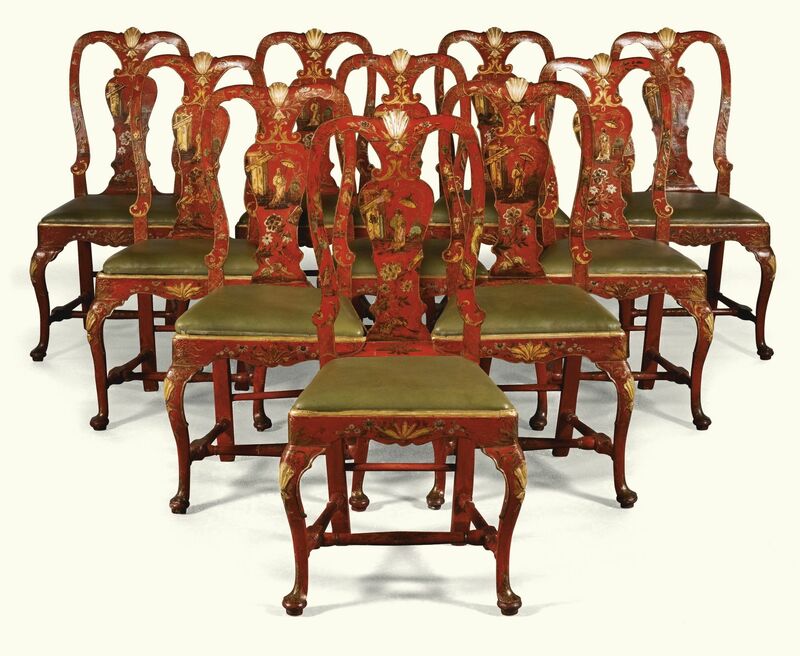 The prices these pieces command at auction are partly their rarity, and partly the finesse of the combination of gilding with a masterful use of colour. The Italians (like the Spanish and Portuguese) were rather magnificent at gilding. The process whereby real metal leaf is applied to furniture using an adhesive base (rabbit skin glue for the good stuff.) This creates a wonderful reflective surface. When you look at gold metal, you think you’re seeing gold, but in reality you’re seeing a whole range of other colours reflected in the metal, all bathing in a golden glow. People have attempted to reproduce that effect in modern times, but have consistently failed. In the Belle Epoque era they came up with the idea of mixing aluminium particles with paint, a precursor to the more recent version of metal particles in resin/varnish. The result comes nowhere close to gilding because the visual effect of the real thing is metallic shine whereas paints and varnishes are read by the eye as a single, solid colour. Not to mention the fact that real gold is stable. Like real platinum it doesn’t tarnish which means you don’t need to dull the metallic shine with varnishes or waxes. When you combine the reflective metal effect with a good colour, you end up with something almost magical. I’ve always suffered from pretty face syndrome 😀 Either people think I don’t think or don’t work… or both! -grin- Don’t worry your pretty little head about it? I hope I didn’t come across as patronising. I’ve always known you were smart, but being an expert in a field is something else. I am impressed. Re your looks. One of the nice things about going grey is that people take me a little more seriously now. Or maybe I’m just so crabby they don’t dare be patronising any more. -giggles- Do you? Just kidding! Such sumptuousness. 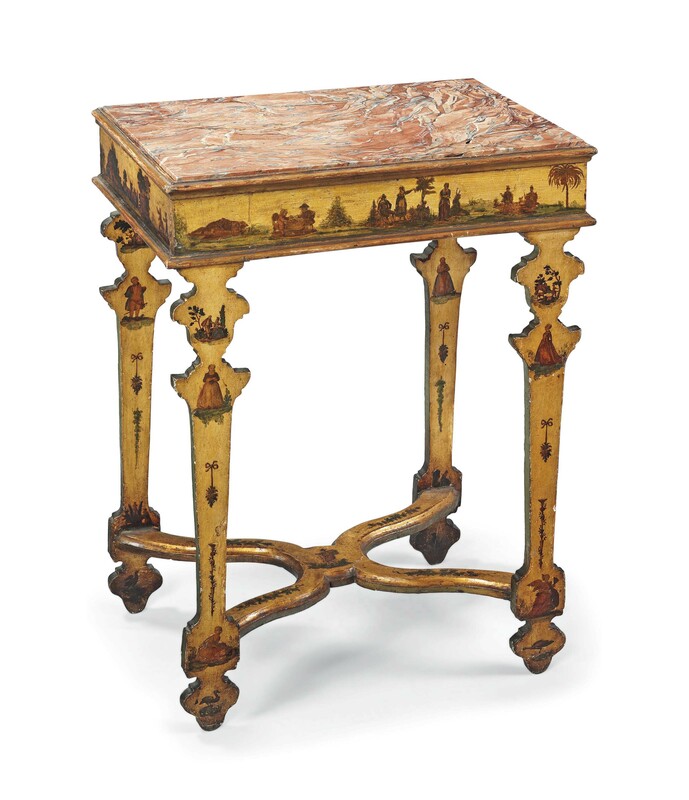 Oh, those Venetian console tables…stuff of dreams. And there’s just something bright and “happy” about this stuff. You walk into a room with one of these pieces and you can’t help but smile. I’m just trying to find a spot for that in my cabin. But then again, I may have to sell the place to buy the piece! That’s really beautiful. How exciting! So when you say cabin, you mean it. If you ever have a moment, post some pictures, I’m a construction enthusiast. I’m pretty sure that’s the only time chinoiserie has been used in a blog headline. I’ve googled it… AND FOUND ONE!!!!! A lawyer blogger obsessed with chinoiserie. Sounds like great Saturday reading. 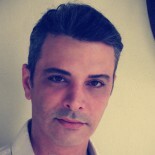 Hi, i’ve just purchased a console and mirror frame painted like the one above in your photo. I wanted to know if you might know what it’s value is. I would be glad to send you a photo. This entry was posted on March 2, 2018 by The Pink Agendist in art, design and tagged antiques, art, furniture, lacca povera, venetian art.